Other brands BCAAs and Amino Acid products can be beneficial, albeit they do not have the powerful potency and comprehensive powerful synergy of ANABOLIC AMINO 10,000™ (AA10K). 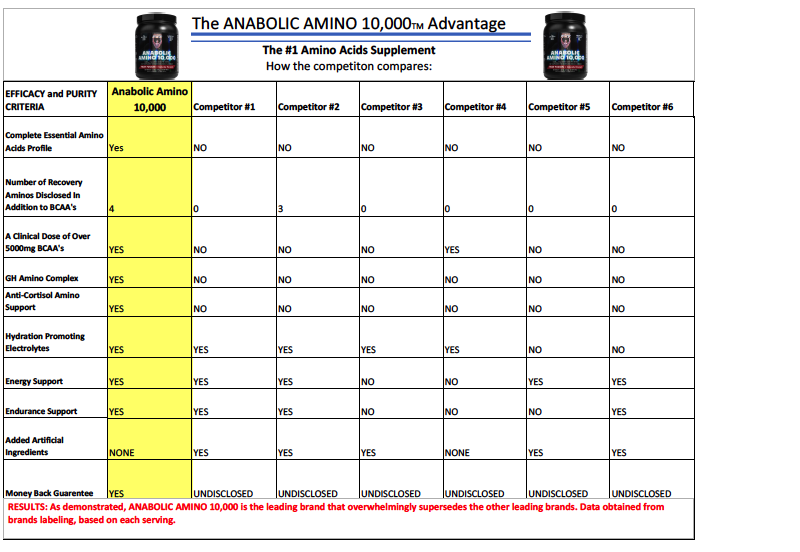 AA10K is indeed unique and peerless, incorporating all of the essential Amino Acids which have proven to be mandatory for maximum results, and are missing from other leading brands which may contain few Amino Acids in arbitrary amounts. Other leading brands may be supported by one or few studies, where as AA10K’s efficacy is supported by dozens of studies and a wealth of scientific data, with independent research clearly demonstrating that the AA10K Amino Acid Profile is the most effective profile for nutritionally supporting Increasing Muscle and Strength. For decades, ANABOLIC AMINO 10,000™ has been and continues to be a worldwide leader and legend in Sports Nutrition and Amino Acids Technologies. 1. Octa-Essential Amino Acids Matrix: Other leading brands do not contain the 8 Essential Amino Acids, which are mandatory for muscle growth to take place or be maximized. AA10K is a Full Spectrum Amino Acids Formulation containing all 8 Essential Amino Acids to further support maximizing results. 2. Tri-Amino BCAA Matrix: Branched Chain Amino Acids (BCAAs) consist of L-Leucine, L-Isoleucine and L-Valine. AA10K BCAAs are the only BCAAs formulated with Correct Proportion Ratio Technology – providing the proper ratio of each BCAA. 3. Sui generis-Seven Recovery Amino Acids Matrix: It is undisputed- the three factors that equate to the best results from training are: Diet and Supplementation, Progressive training, and Proper Recovery. Without proper recovery muscle growth cannot take place or be maximized. AA10K incorporates SEVEN Amino Acids specifically targeted to support enhancing recovery, anti-catabolic, and anabolic activity. 4. 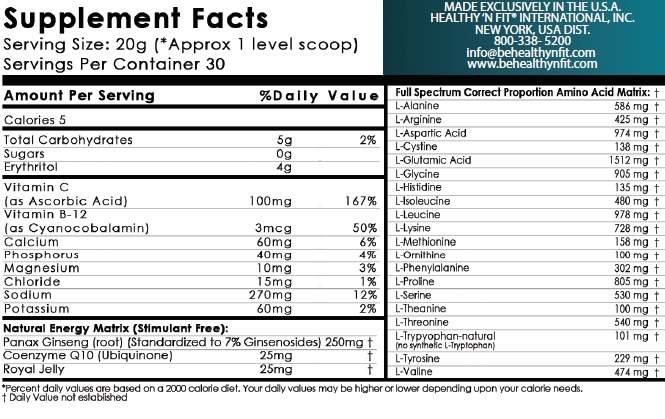 Bi-Amino GH and Energy Matrix: Healthy ‘N Fit® pioneered the GH Technology of today. While other brands’ very highly priced products are based on merely one or few studies, the GH Technology Incorporated into AA10K is based many studies spanning several decades and inclusive of a comprehensive and vast array of scientific literature and technology. PLUS AA10K also supports ATP (jitter-free cellular energy), Endurance, and Performance with ZERO caffeine. 5. UNI-Amino Anti-Cortisol Technology: Excess Cortisol can be produced as a result of intense training or simply from the daily stressors in life. It is known as “the stress hormone” and “the aging hormone”. Excess cortisol can impede muscle growth and may also increase abdominal fat. AA10K is formulated to nutritionally counteract the negative effects of cortisol. *GUARANTEE- Experience the benefits of ANABOLIC AMINO Natural Fruit Fusion Powder for three weeks, and you must be 100% pleased, or simply return the bottle and unused portion with receipt to HEALTHY ‘N FIT for a full refund of the purchased price. We THANK YOU for our 99% Customer Satisfaction Rate. Suggested Use: Mix one scoop into 12 oz (350ml) of cold water, juice, or the beverage of your choice. Use one scoop, once or twice daily. Can be taken after training, between meals, or fi­rst thing in the morning upon waking. A proper diet and exercise program are essential to reach your training and health goals. Question: Anabolic Amino 10,000 Powder contains 20 Amino Acids, whereas other brands contain only a few Amino Acids. Why is this? Answer: Anabolic Amino 10,000 Natural Fruit Fusion Powder (AA10K) is the only leading brand with a Complete Profile of Amino Acids, which are mandatory for maximum results. AA10K contains all three BCAAs and all eight EAAs (Essential Amino Acids), which the scientific data clearly indicates are mandatory for maximum results. In addition, AA10K also contains L-Theanine and L-Ornithine which are efficacious Amino Acids typically not found in other leading brands. Beyond this, AA10K is a mega potency formulation containing 10g or 10,000mgs of Amino Acids per serving. Question: Can you explain in detail the quality of Amino Acids used in your product Anabolic Amino 10,000 Natural Fruit Fusion Powder? Answer: The Amino Acids in ANABOLIC AMINO 10,000 are 100% Pure Whey Hydrolysate Amino Acids and 100% Pure Egg White Albumen Hydrolysate Amino Acids, which the scientific data clearly indicates are the most effective Amino Acids in existence- #1 for increasing muscle and strength in combination with a proper diet and training program. In addition, Anabolic Amino 10,000 Natural Fruit Fusion Powder incorporates FIVE MATRIXES which provide unique benefits. Question: What type of energy ingredients are in AA10K Powder? Answer: Anabolic Amino 10,000 Natural Fruit Fusion Powder also provides support for energy and endurance which are essential for training and well-being, and in addition, electrolytes are included (which are important minerals) that can be depleted from training, and should be replenished for training, health and well-being. Moreover, AA10K supports Energy and Endurance Naturally and contains zero caffeine, zero stimulants, and zero sugars – some of which are found in other leading brands. The Scientific Data also indicates that the excessive caffeine used by some brands may actually make your body work harder and can impede recovery and may minimize results from training. Questions: Many brands call their products pure or clean even though they contain artificial flavors or colors or sweeteners. Why is that? Answer: One should consider that if a product contains artificial and chemical ingredients and claim that they are “pure” and “clean”, are these brands one can trust regarding other claims they make? All Anabolic Amino products are formulated with TRULY PURE™ Technology and contain zero artificial flavors, colors and sweeteners and are banned substance free. Question: I’ve obtained great results from Anabolic Amino 10,000 along with my diet and training program. Can you further explain “Meta-Analytical Sciences” referenced on your label? Answer: Meta-Analytical Sciences is the Methodology utilized for developing our Anabolic Amino 10,000 Powder. Some leading brands utilize one or few studies regarding the effectiveness of their supplements, whereas ANABOLIC AMINO supplements key ingredients efficacy is based on Meta-Analytical Sciences, which is a compendium of numerous studies demonstrating efficacy. Anabolic Amino 10,000 is Guaranteed To Exceed Every Brand or your money back. Question: I love your ANABOLIC AMINO 10,000. Are there any other ANABOLIC AMINO Supplements? It may also be interesting to note that ANABOLIC AMINO has been and continues to be a worldwide leader and legend in Amino Acids and Sports Nutritional Supplements Technologies, and has proven to be consistently on the forefront of technology and purity, with an unparalleled 99% customer satisfaction rate. Question: Can you tell me something about HEALTHY ‘N FIT INTERNATIONAL, the company that produces the ANABOLIC AMINO BRAND? A proper diet and exercise program are essential for reaching your training goals. These statements have not been evaluated by the Food and Drug Administration. These products are not intended to diagnose, treat, cure or prevent any disease. Information such as specifications, ingredients, nutritional information, pricing, and availability, etc. are subject to change without notice. Please refer to the actual label of the product for the most accurate information. As a reminder, it is always recommended to check with your health care provider before taking any dietary supplements or making any changes to your diet or exercise program. Be sure to read the entire product label before taking any product. The information provided on this site or any information contained on or in any product label or packaging is for informational purposes only and is not intended as a substitute for advice from your physician or other health care professional.